Heeft u een vraag voor Gia Huy Hotel Phu Quoc? Of u nu een toerist bent of een zakelijke reiziger, Lighthouse Phu Quoc Hotel is een uitstekende accommodatie tijdens een bezoek aan Dao Phu Quoc. Op slechts 0.01 Km gelegen vanaf het stadscentrum en 10 Km van het vliegveld, trekt dit 3-sterren hotel jaarlijks vele reizigers. Dankzij de praktische locatie liggen alle belangrijke trekpleisters in de buurt van het hotel. Profiteer van de ongeëvenaarde dienstverlening en voorzieningen in dit hotel in Dao Phu Quoc. Maak in het hotel gebruik van een selectie topklasse faciliteiten, zoals gratis wi-fi in alle kamers, taxi service, ticket service, 24-uur receptie, snel in- en uitchecken. Aanvullend beschikken alle gastenkamers over een variëteit aan voorzieningen als handdoeken, slippers, plasma tv, gratis welkomstdrankje, internet (draadloos), om zelfs de meest veeleisende gast te tevreden te stellen. Daarnaast garanderen de talrijke recreatieve mogelijkheden dat u zich tijdens uw verblijf kunt vermaken in het hotel. 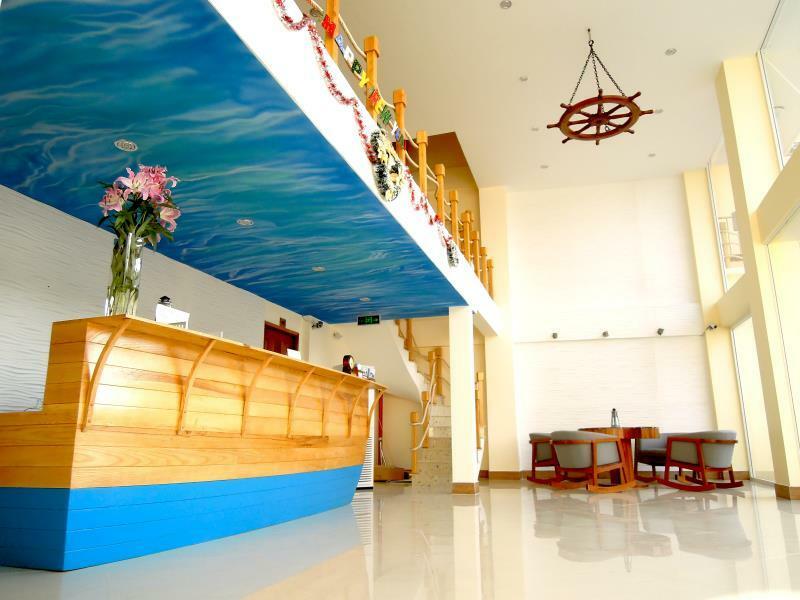 Het Lighthouse Phu Quoc Hotel is een uitgelezen keuze als u een kwaliteitsaccommodatie zoekt in Dao Phu Quoc. The hotel is clean has beautiful decors. It's very close to night market. However I feel that the room door is not ok, because the rain and wind could make it sound loudly. One night I stayed here the fire alarm suddenly rang without reason. Good location so easy to explore north and south of the island. For the price comfortable room. friendly staff. Had a fast check in with complimentary drink and friendly staff. The hotel is located close to the centre of town where there is so much excellent food on offer without going into the quiet boring night market. I'm returning to stay again in a couple of days. Our stay at Lighthouse Hotel was an excellent one. The hotel was smack in the middle of town, beside a quaint little cafe as well as a dive center. It also has local coffeeshops just across the road and the Duong Duong Night Market is within walking distance. In fact, it is walking distance to most of the cafes and necessary amenities. The room was clean and had lots of light, and you could even see the sun set if you take the room facing the sea. Perfect for somewhere to stay when diving and wanting to eat in town. The room has a partial view of the sea, if the houses along the coast are 1 floor higher, it would have block the view. Breakfast selection is very little but tasty. They do try to change the type of noodles daily. The location is close to the night market which is about 10 mins walk away. The port is about 7-8 mins away. For those that likes to dive or snorkel, there are a few dive centres around not more than 10 mins walk from the hotels. There is one dive centre (Rainbow divers) beside the hotel (less than 1 min walk). Really enjoy with my family and friends. Distance between hotel and night market/ beach is not too far, suitable to hang out at night and enjoy seafoods. Staff is too friendly, fully support anything from customer. Advise us many good services with competitive price. Phu Quoc is not a holiday destination I would visit again! I have never seen so much garbage everywhere in Vietnam. The local population throws what it does not need just away, on the streets, in the Sea, on the Beaches. Every village I have seen on Phu Quoc is just a Garbage Dump. Doung Dong the worst. Half the Island is a gigantic Building Place, easy 20 or more BIG Hotels going up at the same time. Weather was bad when we where there (October). Nothing to see really, only the main roads with Tarmac, small roads a quagmire of soft clay in rain and potholes in Dry. Prices 50 % above much nicer Places in Vietnam. Do NOT go there if you want to have a good Holiday. The Hotel is what it is, a simple 3 star hotel. Nicely laid out, with good Sea view from most rooms. No Balconies. We had no internet on Floor 5 (repeater fail, staff told us, it would be repaired the next day, but it was not), so we got a relocation to floor 4. Both floors offer Sea view which is rare on Phu Quoc. Breakfast was okish for 2 days, from Day 3 we preffered nice Breakfast arround the Corner. The Big Plus of this Hotel is its location, ample food and the little night Market and Shops all arround. As the other places of interest are to far to work, you need a scooter. The night market is small and VERY noisy due to construction site adjacent and stalls relying on mobile noisy petrol powered energy generators. The location is good as it is just right next to the night market and in the central of the island, so you can head to explore the north and the south of the island. The room conditions are quite new and clean. The breakfast is just ok with few dishes and the space is quite small, esp when ppl don't get in line. The only issue we had was that the receptions did not check carefully to give us the breakfast coupon though we already booked for it. Only after we argued with her in the early morning, then she took us in. As the domestic hotel in Phu Quoc island, it is far more clean and comfortable compare those local hotel with the same standard. I am here to work in a project for almost 25 days, they are not pricey at all for such a long stay and their beds are as comfortable as those 4 to 5 starts hotels in Vietnam. The whole hotel been covered by high speed wifi, I wouldn't have any problem to connect to my office or my social media website. It is walking distance to some local food stalls and neighboring with 2 local cafes which serve food as well. Even it don't have a restaurant or cafe in the hotel, I have no problem with my breakfast, lunch or dinner either. Lighthouse hotel is simply the best among it range. Clean hotel, friendly staff, will help you organize tours and motor bikes. The hotel is very clean with nice modern rooms. It has a cool roof top deck from which to look over the town and night fish market right across the street. The staff was also very helpful in organizing a snorkeling tour for us and also renting motorbikes to us for us to explore the island with. The main problem with the hotel is its location. It's near the town and right across from the fish market but the nearest beaches to swim at are not within walking distance and there is no pool to supplement this with. If I were to go back to phu quoc I would try and stay a kilometer or 2 south from the lighthouses location in order to have access to a beach from the hotel. Also if you go to phu quoc check out rory's beach bar and pub which is a few kilometers south of the lighthouse hotel. If you ask him to give you a map and tell you the spots to check out on the island he'll give you some good advice and a better map than the hotel will give you. i like the architectural design of this hotel, which is connected to lighthouse/ocean topic. This hotel is new and located near to the Long Beach restaurants and the night market, which is convenient for visitors to go on foot (save money for taxi/motorbike rent). The room is not so large, but ok for two persons. Airport transfer is not free in here, booking a car to airport via the hotel will even cost you 250k VND, while taking taxi only costs 140k VND (distance between airport and the hotel: ab 12kms). This hotel will be a good choice for backpackers rather than couples enjoying honeymoon. Nice location, good price when not over 40$. Sometime they put the room at over 100$. Very nearby night market, room clean, breakfast has a little bit choice. My second stay here. The economy room is small but we'll appointed. Excellent wifi good selection of tv channels and comfy bed. Staff are friendly and helpful didn't try the food.